AFP Interactive Hyper Fetch is an automatic ball launching machine for small dogs. 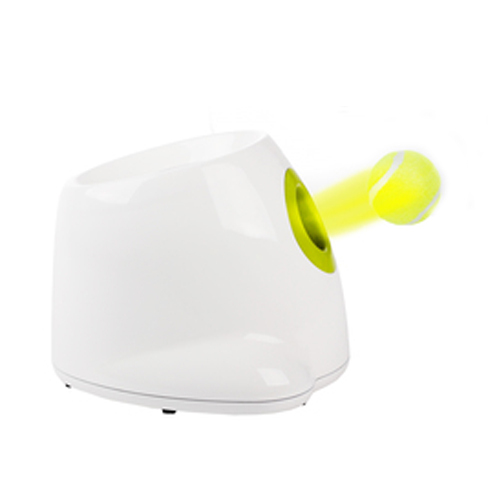 Interactive Hyper Fetch Mini from All For Paws is an automatic ball launching machine for small dogs. For medium to large dogs, we also have the AFP Interactive Hyper Fetch. This fun ball launcher can provide your dog with hours of entertainment. The dog places the ball into the top of the AFP Interactive Hyper Fetch Mini and 10 seconds later the ball is launched. The Hyper Fetch is easy to set up for 3 different distances of: 3, 6 and 9 metres. Do not leave your dog alone with the ball launcher. The Hyper Fetch Mini does not have a remote control. AFP Interactive Hyper Fetch Super Bounce Tennis Balls sold separately. The balls come in packs of 6 and can also be used in the AFP Interactive Fetch'N Treat. To teach your dog to play with the AFP Interactive Hyper Fetch himself, you can use the AFP Interactive Fetch'N Treat. When your dog has learned how to do this, you can make optimal use of the AFP Interactive Hyper Fetch. The AFP Interactive Hyper Fetch Mini comes with 3 balls. The diameter of a ball is 5 cm. Balls are also sold separately AFP Interactive Hyper Fetch Super Bounce Tennis Balls. Have you used AFP Interactive Hyper Fetch Mini before? Let us know what you think about this product.